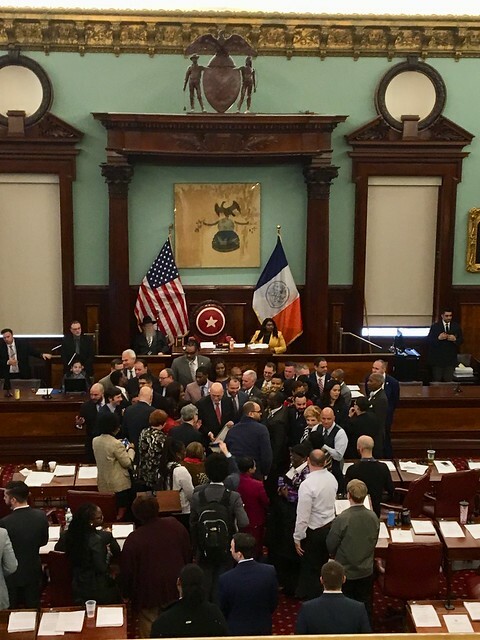 New York City Council's meeting yesterday afternoon. 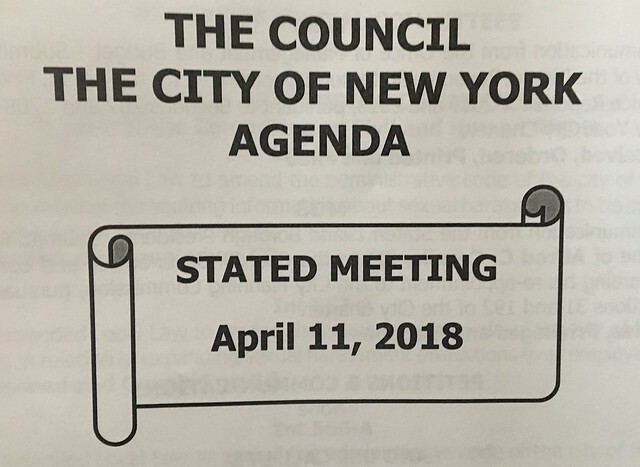 On the agenda was a vote on an important Gowanus issue that I have written about on this site from the very beginning: an application by the New York City Department of Environmental Protection for the proposed site selection and acquisition of three privately owned properties at 242 Nevins Street, 270 Nevins Street, and 234 Butler Street "to facilitate the construction of the “Head End Facility” as part of the larger project to construct combined sewer overflow (“CSO”) control facilities to reduce the volume of untreated wastewater entering the Gowanus Canal." This project is located in Council Member Stephen Levin’s district, who attended the meeting. 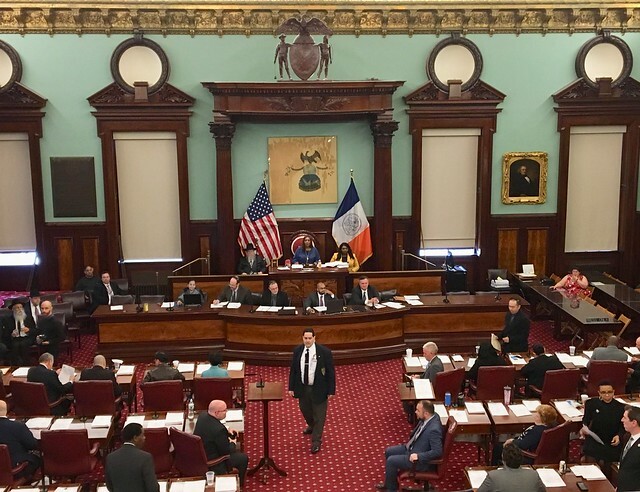 His colleague, Councilmember Brad Lander, whose district covers a larger section of the Gowanus Canal, was absent. This land acquisition at the head of the canal only accommodates an 8 million gallon CSO retention tank mandated by the Federal government as part of the Environmental Protection Agency's Superfund clean-up of the polluted waterway. D.E.P. also has to construct a 4 million gallon tank in the middle portion of the canal, in Councilmember Brad Lander's district. 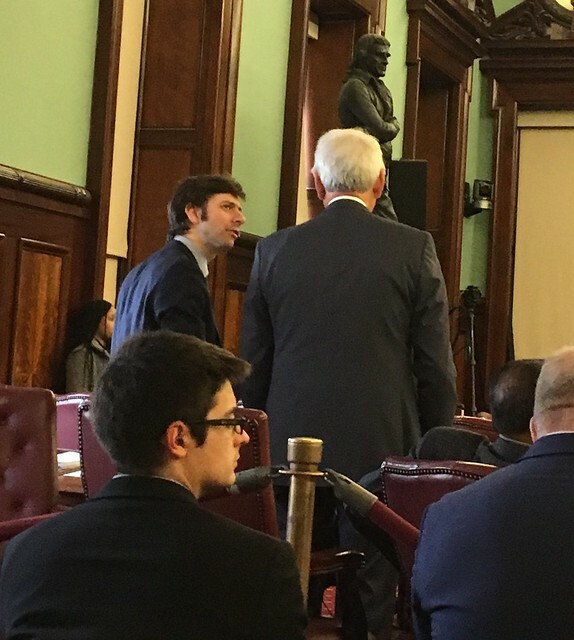 At a hearing of the City Council's Subcommittee on Landmarks, Public Siting and Maritime Uses on March 12, 2018, D.E.P. 's Kevin Clarke testified that the cost for the entire 'program' that includes both tanks is estimated to reach $1.2 Billion. That is more than twice the entire cost of the Superfund Clean-Up, which E.P.A. estimates at $500 million. The estimated cost for the acquisition of the sites at the head of the canal is $90 million, according to Clarke, with an additional $400 million for the construction of the 8 million gallon tank. Please keep in mind that the EPA estimated the cost at $77 million for both tanks, suggesting that they be build on land already owned by the City to keep cost down. I had hoped for an animated discussion on the item from his fellow Councilmembers. After all, it is not every day that the City proposes to spend such a huge amount of money in two Councilmen's districts. 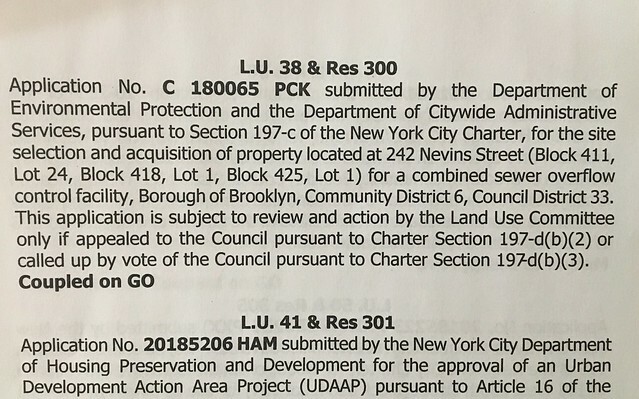 Imagine my surprise when I realized yesterday that application # C 180065 PCK for the site acquisition at the head of the canal was bundled together with at least 25 other items, safely camouflaged with several items pertaining to the “Stop Sexual Harassment in NYC Act". 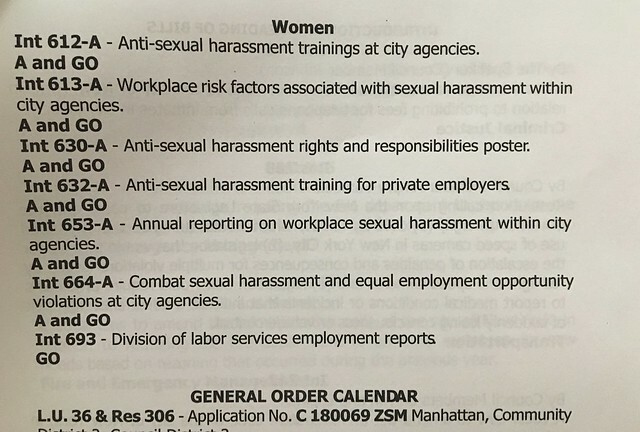 Now, I applaud all the Councilmembers who voted overwhelmingly to support the #MeToo movement and secure protection from sexual harassment, yet one wonders if they were even aware that they were also voting for such a huge ticket item. On the other hand, I may just be naïve. After all, such items are regularly slipped into bills and votes in Washington and Albany. Please don't misunderstand me. I support the construction of both C.S.O. retention tanks. The City has to stop using the Gowanus Canal as an open sewer. But the City which has ignored the pleas of the community to stop dumping raw sewage into our canal for decades now seems to want to line these tanks in gold. Indeed, with a massive re-zoning of the Gowanus corridor that would allow the construction of residential buildings in this once vibrant industrial neighborhood, one has to wonder if the City is instead planning what one Gowanus resident recently called "the Taj Mahal of sewer treatment facilities" to accommodate developers and their planned condos instead of two simple tanks as mandated by the E.P.A. Incredible, the lack of transparency. And no word from the Capo di Capo Lander in whose district this also lies? Why are they not y putting these tanks under the polluted and dangerous site where the current pool is located in the "Double D" park? That is land owned by the city (no cost for eminent domain) and it must be cleaned up anyway? Put the pool in Brooklyn Bridge Park (which lacks one, despite the broad human outcry for 35 years for one) and allow the tanks to be stored where this toxic site is today. Or find another park to host the pool temporarily while the site is cleaned up. This is a ridiculous plan to take away land from private owners when perfectly useable land is available right there, that costs nothing. Yes, telling that Lander, who has “no position” on the BQX, was absent when voting took place. Another instance in which he disappoints. His aid said he was out of town. Probably knew the vote was a done deal. Thanks, Katia. Fair enough if out of town, I guess, but it does seem awfully convenient! I hope the Americans will be canceled now. Is the city still kicking out Eastern Effects studios? Also, they're not putting this under the Thomas Green Playground because people protested that idea. $400 million, $600 million, $1.2 billion, build it in the park or not; what this really shows is just how inept and heavy handed the EPA is, and how the City taxpayers have been at saddled with this massive bill. Anon 3:58 You have NO IDEA what you're talking about. The EPA cleanup bill goes to the polluters. It was the CITY that decided they wanted to use eminent domain - taxpayer dollars - to build the tanks on the western side of Nevins Street. EPA's plan was to build it on land that would not have needed to be purchased - the park - and that park needed to be dug up anyway to clean up the toxic soil beneath it. EPA's plan was a win-win. Thanks the Fifth Avenue Committee and the Double D Park group that pushed for the plan to tear down the buildings on the western side of Nevins, using eminent domain. What's their real agenda???? It was an extremely ugly maneuver - in the name of "saving the pool." The EPA promised that there would be a relocated pool. This City move is disgusting - but do not blame the EPA! Anon on April 13 @ 358 PM sounds like a toll for the DEP, perhaps one of those folks who get grant funds from the city to provide the city political cover for the city's decisions here-- cause it looking more like the city PR folks want this to appear as if it is a EPA driven budget item, when it is all DEP, Levin, and Lander choosing to saddle all New Yorkers with this big budget item.